I currently have just two chickens, a red hen who is four or five years old, and a very pretty rooster who is about a year younger. I've always kept my chickens confined in the chicken coop and run because of our predator problems. Last summer the remains of my flock found a hole in the fence and began free ranging. I had so much going on at the time that I didn't get around to fixing the hole and although I've lost the rest of them, these two have been on the loose ever since. They're seldom apart, devoted to each other. 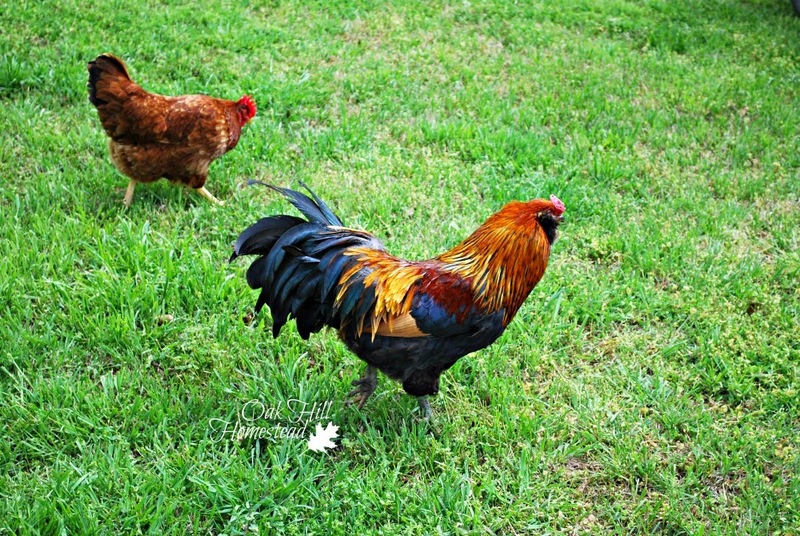 The rooster waits nearby while the hen lays her almost-daily large brown egg in the goat shed. Several times a day they trek out to the front yard and forage under the bird feeder for the seed that the songbirds have kicked out. They roost at night on the bare rafters of a roofless old building. I enjoy coming home and seeing them walking across the yard or up the driveway. Watching them follow each other around makes me smile. I'm getting chicks later this summer but these two can stay in the yard where they are happy. He is lovely, isn't he? I know that his color is black-breasted red, and that he is at least half Americana or Araucana. Friends gave me a dozen barnyard chicks that were fathered by an Araucana rooster. 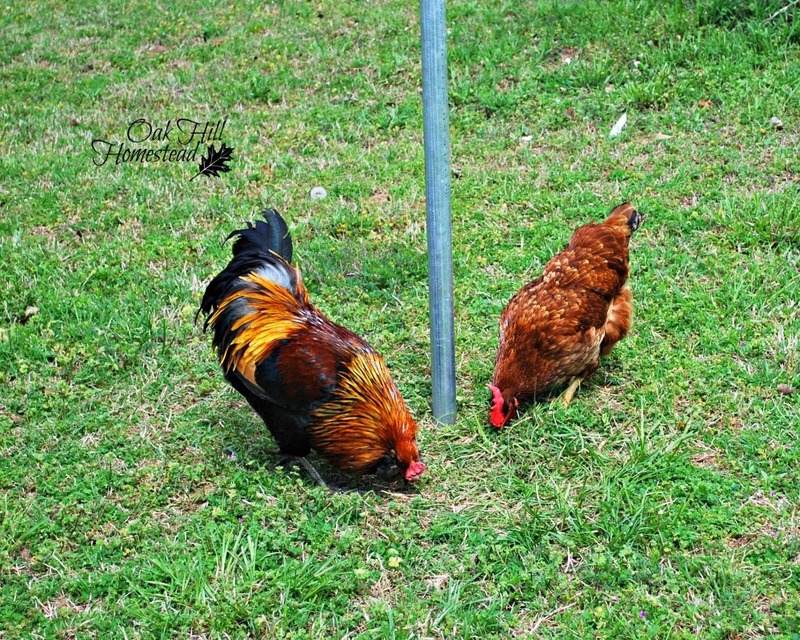 Taking care of chickens and other livestock can be challenging in the winter, for sure. I don't blame you for thinking twice about that! 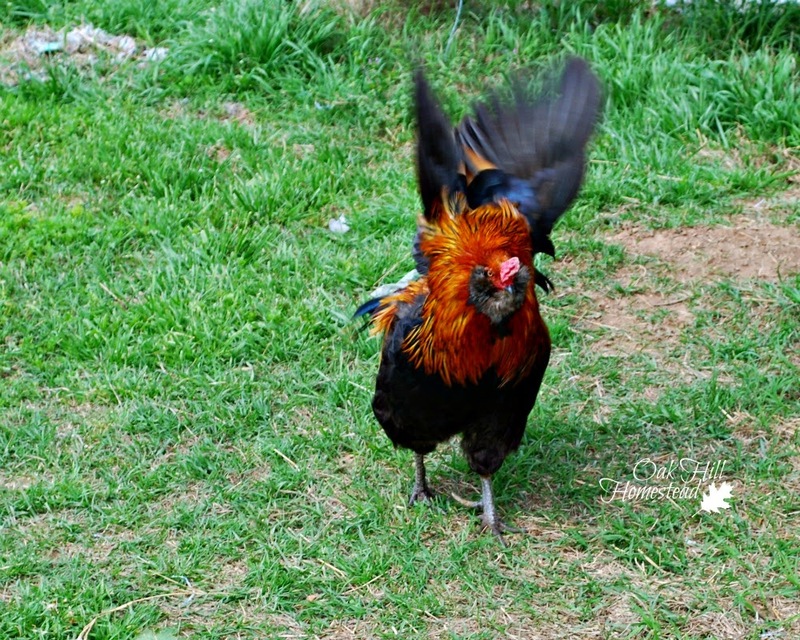 Roosters can be rather intimidating. I'm fortunate that this guy is quite gentle, I can pick him up and hold him. Thank you for visiting, Angie. The rooster says thank you, Vickie. He thinks he's a pretty handsome guy. Thank you for stopping by. Wow! What a looker! Thank you for stopping by to share this wonderful outdoor post on the Maple Hill Hop! Thanks, Daisy. Thank you for hosting the Maple Hill Hop each week. He is pretty...what kind of chicks will you be getting? A couple of friends have offered barnyard cross chicks; if that doesn't happen I'll order my old standby buff orpingtons or black australorps. What kind did you get this year, Michelle? I have an eclectic mix....black Jersey Giants, Cinnamon Queens, Barred Rocks, some Australorps ( not my favorite), Easter Eggers, production reds, and 26 male chicks from a Cinnamon Queen hatch so basically Delaware's to do my pastured poultry trial run. Bought 1 length of electro-net. My that Rooster is a colorful and handsome fellow. I hope nothing happens to these 2 since you lost the others to predators. Here in town people are now allowed to have a certain amount of chickens and several of our neighbors have them. I love that communities are allowing a few chickens in the backyard, Ida. What a great story about these two. They are both beautiful! Thanks for linking up at the Weekend Blog Hop at My Flagstaff Home! What a cool thing to come home to! Based on our neighborhood rules, this isn't something we can re-create at home, but my in-laws keep quite a brood. I like the lessons my boys can learn from this even though it's not a daily part of life. I agree, Steph, animals can teach our children so much. Thank you, Terri. It's nice to have a rooster who is protective of his girls but who is also nice to his humans, isn't it? I really enjoyed reading this post, Kathi! 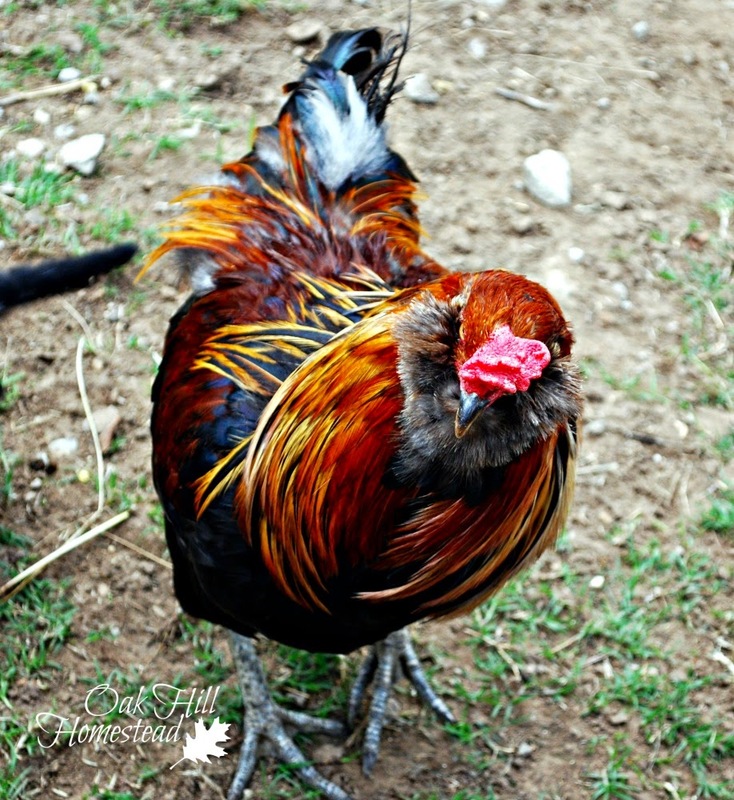 Your rooster and chicken are beautiful and how lovely to have fresh eggs! Thank you so much for sharing with us at the Hearth and Soul hop. Thank you, April. The hen recently found a new, secret spot to lay her eggs - I hope I can find it soon!